Social Energizer would like to congratulate Dawn Byczek, of the Adams Inn (formerly Adams Super 8), Adams, WI as the prize winner of our Hotel Web Services Giveaway at the WH&LA Convention and Trade Show on Oct 22, 2012. Dawn was among the nearly 200 participants who attended the convention and trade show at Kalahari Resort in Wisconsin Dells. Hoteliers from all over the state converged to learn new techniques in hotel management, to discuss recent hotel trends and to partake in a broad spectrum of presentations and exhibits. 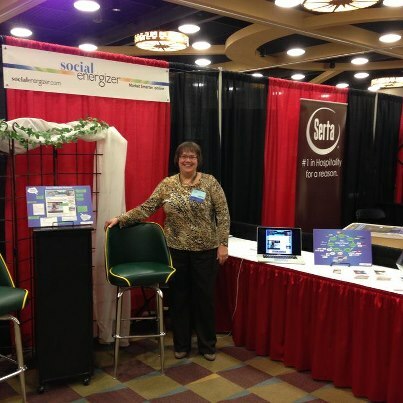 This was Social Energizer’s first year at the show and we found many owners and managers of small and medium-sized hotels that were interested in finding new ways to market online. Online Booking Engines and Property Management Systems integrated into hotel websites topped the discussion with tips on travel-specific social media networking running a close second. Our jungle theme “Don’t just survive. THRIVE!” was a fun takeaway with Posada Yum Kin Hotel, Tulum, Mexico as the featured case study. Their success story from the jungle’s of Tulum is one we love to talk about. For members of WH&LA, Social Energizer is also offering a free annual listing on our directory site, RelaxWisconsin.com. It lists a wide variety of fun things to do and places to stay in Wisconsin. Who doesn’t like free advertising? To enter simply click on the WH&LA logo on the right edge of our homepage. You will be taken to an easy to fill in form where you can describe details about your hotel. Simply fill it in and you will shortly find it listed under the Stay category of RelaxWisconsin.com. You can also return to the site for updates as often as you wish. Please enjoy reviewing our site – we are adding new properties every day.